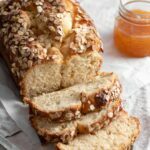 This Peach Brioche Bread Recipe is a twist on the classic French version made with fresh peach preserves. Soft and rich, this bread screams breakfast! Add flour, sugar, yeast, and salt to the bowl of a stand mixer. Using paddle attachment, mix ingredients together at low speed. Test gluten formation in the dough by tearing off a small piece and stretching up towards the light. If light is visible through the dough without it breaking, its ready. This is known as the Windowpane test. If not, beat for a couple more minutes and test again. Change mixing attachment to the dough hook. Beating at medium-high speed add in a third of the butter. Allow butter to fully incorporate into the dough. Repeat with remaining butter, a third at a time. Continue to work the dough until pulls away from the sides of the bowl. Transfer dough to medium bowl that has a light coating of cooking spray. Make sure to scrape all the dough out of the mixing bowl as it will be a but sticky. This is a moist dough, no need to add more flour. Working the dough will help it gain a stronger structure. Next, place bowl with dough in the refrigerator for 30 min. Chilling the dough helps to enhance the flavors. Make egg wash by stirring together egg white and water with a fork in a cup or small bowl. Place dough on a heavily floured surface and punch out an excess air. Using a floured rolling pin, roll dough into a 16x12 in rectangle. Brush egg wash on the far edges of the dough. This will help when pressing the sides together. Sprinkle cinnamon powder evenly across the peach preserves. Press the seam together with fingertips. Gently shift log to over so the seam is not on top. Take a bench scraper and slice the log lengthwise into to pieces. Rotate the open sides upwards to expose the preserves to the top. Twist the two pieces together slowly. Pinch the end pieces together. Carefully transport the dough into loaf pan. Brush dough (not open preserve sections) with a thin coat of egg wash. Loosely cover with plastic wrap and set in warm location for a second rise (~ 1hr). Bake loaf for 20 min. Remove and add a loose cover of aluminum foil to prevent over browning the top of the loaf. Continue baking for an additional 45-60 minutes. Or until baking thermometer inserted into middle reads 190F (88 C). Any cooler and you will have an uncooked doughy center. Place loaf pan on cooling rack for 10 min. Grab strips of parchment paper and lift loaf from the pan. Continue to cool on rack another 10 min. Transfer to serving dish and slice! !